The Mini Cooper Register is very pleased to tell you that we have secured sponsorship for the club and members from Mini Sport Ltd. This will take effect from 1st March 2018. Mini Sport’s association with the Cooper family and Paddy Hopkirk is going to fit well with our club and we look forward to working with them and strengthening our bonds. Mini Sport will also offer an exclusive discount to the club and its members. We hope you all agree that this is a good, positive step forward and we are delighted to welcome Mini Sport as another club sponsor. 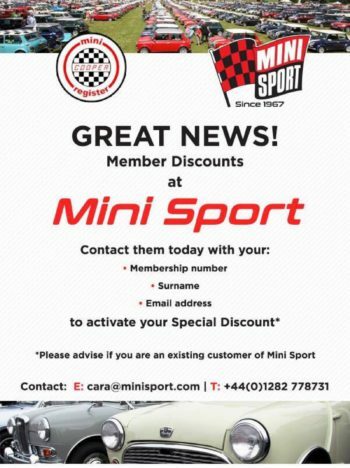 Mini Sport are now offering exclusive member discounts!